Real Purity mascara gives your eyelashes a healthly, conditioned feel while darkening and thickening your lashes, naturally. Real Purity is a cosmetic and skin care company that focuses on providing consumers natural formulations that are chemical-free and of the best quality. The company's founder, Virginia Easterling, is a former aesthetician who became passionate about creating products for the skin without using harmful synthetics and irritating chemicals. Easterling launched the J-Rich Clinic in 1971 to further her private pure makeup and skincare study. The Ypsilanti, Michigan clinic is where she began her search for natural skin problem cures for her patients and where Real Purity was born. Since 1995, Virginia's son, Dr. Rich Easterling, has led Real Purity as the acting CEO. As a Naturopathic physician, Dr. Rich Easterling is committed to finding scientific confirmation of the use of herbs and vitamins in skin care and cosmetics. The company's motto is "People Before Profit." Real Purity does not test their products on animals. Real Purity's popular mascara contains no chemicals, making it a favorite cosmetic tool for women who have chemical allergies. The mascara has a purified water base which makes it easy to remove and gentle on the eyes. Each .30-ounce tube comes with a brush-on wand. The mascara tube is shiny black and the standard sized brush is easy to hold. Available shades are Black, Sable Brown and Navy. Unopened mascaras will last for one year if stored properly in a cool, dark space. After you open the product, you will need to replace it every three months just as you would chemical-based products. This relatively small company does not use safety seals on their mascara tubes. To get the best results from your all-natural cosmetic, follow these application instructions. Open the mascara and swirl the wand in the tube. Do not pack the mascara in the tube. This pushes the paint to the bottom. 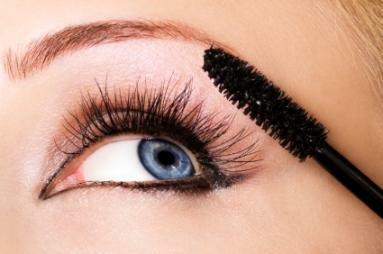 Apply the mascara to the eyelashes first using just the tip of the wand. This will give your lashes length. Reapply the product to the wand to get more mascara on the brush. Apply the mascara again this time, turn the wand sideways, laying it parallel to the face. This will give your lashes volume. Allow the mascara to dry a minute before reapplying a second coat, if you like a darker look. Touch up lashes during the day as needed. Free of chemicals, this cosmetic product contains the following ingredients. You can purchase Real Purity mascara from the Real Purity website or at natural makeup stores. Visit the Real Purity website to purchase their mascara, lipsticks or skin care products. The mascara sells for $13.00 plus tax and shipping. If you suffer with eye allergies it may be caused by chemical irritants commonly found in regular mascaras. Real Purity Mascara is a gentle product that contains only natural ingredients that are not harmful to sensitive eyes.